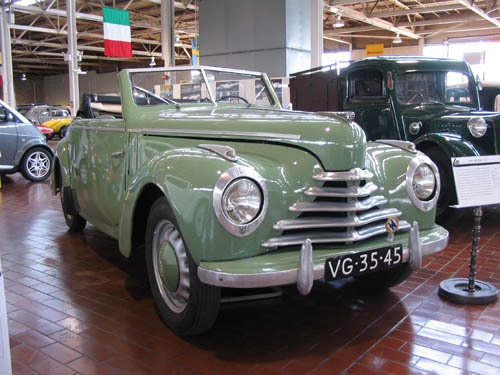 By 1919, the Skoda Company had its own automobile department and began building cars under license. In 1925, they produced their first cars under the Skoda name. The two door body style which you see here was also called the “Tudor,” and it was introduced as Skoda’s first car after World War II. It has a steel body on a wooden frame mounted on a backbone chassis. The 1101 was available as an ambulance, police car, delivery van, roadster, or jeep for the armed forces. A four-door version was also available. Many of these cars were exported to Europe as well as Australia, South America, and Africa. Today, Skoda produces over 400,000 vehicles annually; their largest markets are in Slovakia, Germany, Poland, Great Britain, Austria, France, and Italy.